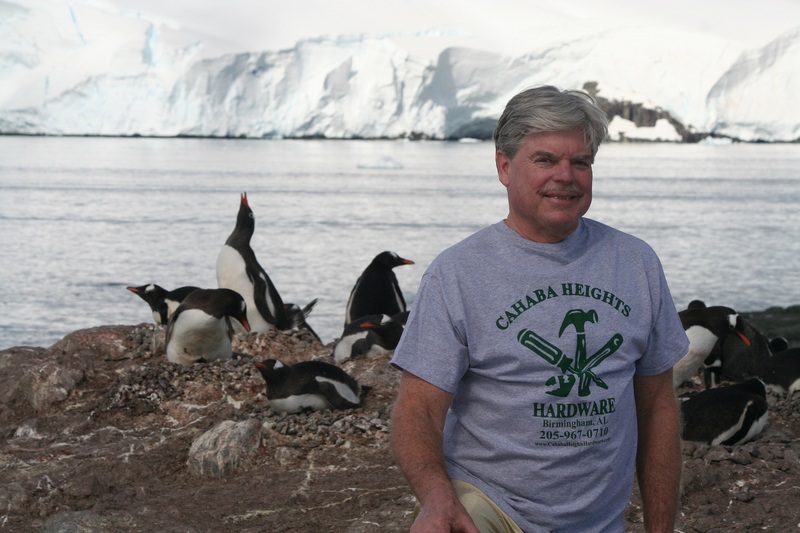 Cahaba Heights T-Shirts have been spotted in lots of far away places, but never as far and as cold as the continent of Antarctica. Thanks Jim for your patronage and the forethought to take along a piece of home to wear proudly in one of the most desolate places on earth. James B. McClintock is the Endowed University Professor of Polar and Marine Biology at the University of Alabama at Birmingham. He received his Bachelor of Science degree from the University of California at Santa Cruz (1978) and his doctoral degree from the University of South Florida (1984). In 1987, after completing a National Science Foundation Postdoctoral Fellowship at the University of California at Santa Cruz, he joined the faculty of the Department of Biology at the University of Alabama at Birmingham. He became a Full Professor at UAB in 1997 and has also served as Dean of the School of Natural Sciences and Mathematics (1999-2003) and as Interim Dean of the Graduate School (2003-2005). Dr. McClintock’s research has been funded continuously over the past 25 years by the National Science Foundation and focuses on aspects of marine invertebrate nutrition, reproduction, and primarily, Antarctic marine chemical ecology. Over the past decade his research has also encompassed studies of the impacts of rapid climate change and ocean acidification on Antarctic marine algae and invertebrates. He has published over 250 scientific publications, edited and written books, is invited to make numerous scientific and popular science presentations, and his research has been featured in a variety of public media outlets including the NPR Diane Rehm Show, NPR’s “On Point” with Tom Ashbrook, National Geographic Magazine, Smithsonian Magazine, Discover Magazine, Scientific American Magazine, CNN, the Washington Post, Wall Street Journal, Chicago Tribune, Los Angeles Times, and The Weather Channel. He has been an invited speaker for ‘TEDx’ (Birmingham) and ‘The Moth’ (Lincoln Center, New York) and has served on workshops sponsored by the National Academy of Sciences on Climate Change and Polar Ecosystems. He recently returned from his 14th research expedition to Antarctica where over the past two decades he and his research collaborators have become among the world’s authorities on Antarctic marine chemical ecology and drug discovery and have developed an award winning interactive educational outreach web site (www.antarctica.uab.edu). His expertise on the ecological impacts of climate change and ocean acidification on marine life of the Antarctic Peninsula has garnered numerous invited lectures and he writes in the popular literature on this timely topic. His book Lost Antarctica: Adventures in a Disappearing Land (Palgrave/MacMillan) was released in September 2012 (paperback edition released in 2014 with a Foreward by Sylvia Earle) and has garnered considerable national and international praise (www.lostantarctica.com). In June 2013, a video short based on his book was produced and released by the EO Wilson Biodiversity Foundation that featured narration by Harrison Ford. His second book A Naturalist Goes Fishing (St. Martins/MacMillan), released in November 2015, combines fishing adventures with an overview of pressing needs for freshwater and marine conservation (http://us.macmillan.com/anaturalistgoesfishing/jamesmcclintock). He has been the recipient of numerous awards and distinctions including the UAB Ellen Gregg Ingalls Recognition for Excellence in Teaching and the UAB Caroline P. and Charles W. Ireland Prize for Outstanding Scholarship. In 2001 he was selected as the winner of the Wright A. Gardner Award for the most outstanding scientist in the state of Alabama and he was selected in 2012 to serve on the Advisory Board of the EO Wilson Biodiversity Foundation. He is an elected Fellow of the American Association for the Advancement of Science, an elected Trustee of The Nature Conservancy (TNC), and an elected Fellow of the Explorer’s Club. In 1998 the United States Board on Geographic Names designated the geographic feature “McClintock Point” in honor of his contributions to Antarctic science. ← Let it Snow 2013!